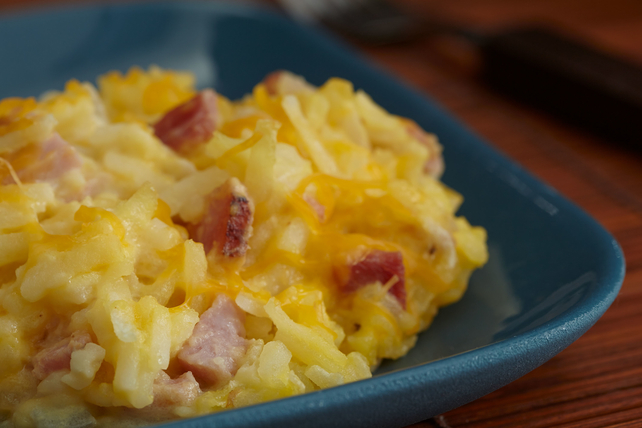 Combine the best of breakfast flavors all into one dish with our Ham & Cheese Hash Brown Casserole. Try our tasty Ham & Cheese Hash Brown Casserole today! Heat oil in large skillet on medium heat. Add onions; cook 2 to 3 min. or until crisp-tender, stirring frequently. Spoon into large bowl. Add potatoes, ham, soup, sour cream, 1 cup cheese and mustard; mix lightly. Spoon into 13x9-inch baking dish sprayed with cooking spray; top with remaining cheese. Melt 2 Tbsp. butter; mix with 30 crushed round butter crackers until blended. Sprinkle over casserole before baking as directed.